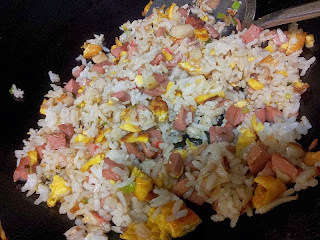 My helper used to cook a delicious and tasty plate of fried rice, with the 'wok hei' smell. 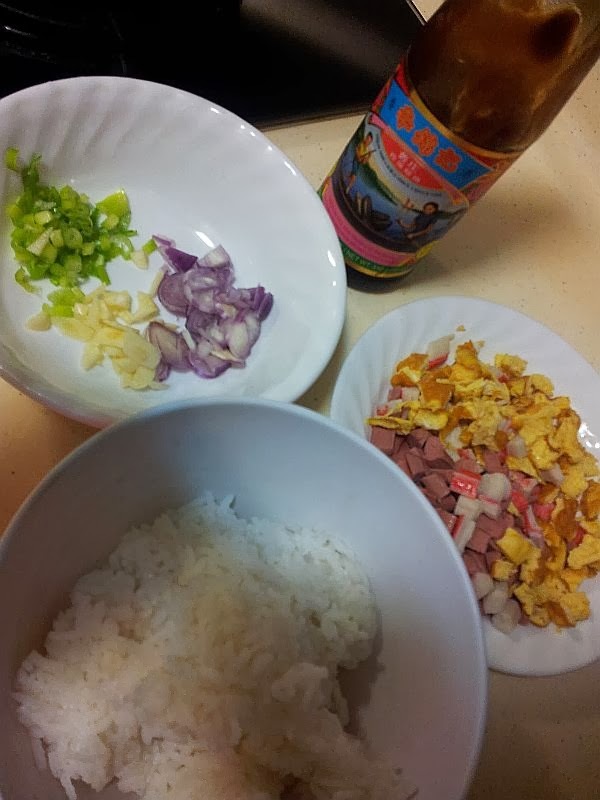 There are a few 'secrets' to cooking the perfect fried rice and here's where I would share with all you as I learnt from my Indonesian helper. Your wok has to be very hot and smoky. So turn up the fire to maximum! Don't overdo your saucy seasoning. This is to prevent your rice from becoming mushy. Here's my simple recipe which I basically used the leftover ingredients from my sushi lunch. 2) Wait for the wok to be smoky before putting in the oil and garlic, shallots. 3) Keep stirring so that the garlic does not turn black. 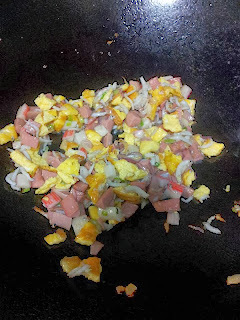 4) Throw in the chopped up ingredients. Keep tossing. 5) Then put in the cold rice. Season with a little of light soya sauce and oyster sauce. 7) Lastly, throw in the spring onions and toss a little bit before turning off the fire. Taste it before you off the fire to see if it suits your taste. I also like adding white pepper to my fried rice for extra flavour and kick.